Darien police will be looking for distracted drivers during April, “National Distracted Driving Awareness Month. The Police Department is partnering with the National Highway Traffic Safety Administration in April, for the NHTSA’s U Drive. U Text. U Pay. high-visibility enforcement effort. The goal of the campaign is to step up enforcement efforts to catch distracted drivers and enforce distracted-driving laws. Distracted driving can result in expensive tickets. Over the past decade, distracted driving has become one of the leading causes of vehicle crashes on our nation’s roads. 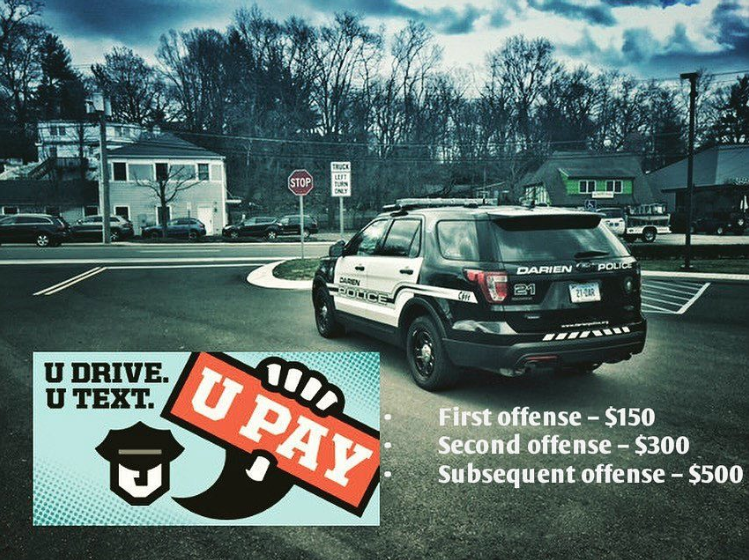 The Darien Police Department is encouraging drivers to put down the phone and remember: U Drive. U Text. U Pay. —If you are expecting a text message or need to send one, pull over and park your car in a safe location. Once you are safely off the road and parked, it is safe to text. —Designate your passenger as your “designated texter.” Allow them access to your phone to respond to calls or messages. —Do not engage in social media scrolling or messaging while driving. Cell phone use can be habit-forming. Struggling to not text and drive? Put the cell phone in the trunk, glove box, or back seat of the vehicle until you arrive at your destination.